19 March is the Solemnity of St Joseph, spouse of the Blessed Virgin Mary and foster-father of Jesus Christ. 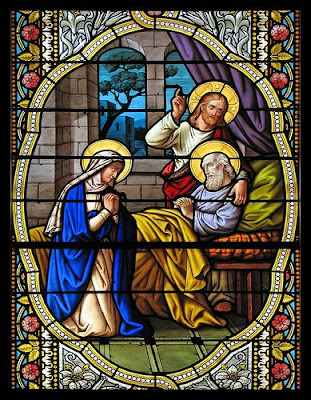 By tradition, St Joseph died in the arms of Mary and Jesus, and for this reason, he is the patron of the happy (blessed) death. "Father, You made us in Your own image and Your Son accepted death for our salvation. Help us to keep watch in prayer at all times. May we be free from sin when we leave this world and rejoice in peace with You for ever. Amen." This stained glass window is in the parish church in Lourdes, France. This Blog is beautiful....but then, so are you sister!